← How to print PDF to any paper size via command line? 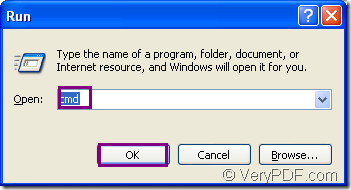 Not every software can convert wmf to pnm and rotate the page so perfectly like HTML Converter Command Line.It will only cost you no more than 2 minutes and three steps.Owe to the powerful functions of HTML Converter Command Line,you can set many parameters to the source file and target file.It is also very convenient to input command line in cmd.exe program instead of opening GUI which will be a waste of time if your computer configuration is not enough.This article will introduce HTML Converter Command Line to you and show you how to rotate the page when converting wmf to pnm. HTML Converter Command Line is a powerful HTML conversion product. It allows you to create previews or thumbnails of web pages in a number of different formats, such as TIF, TIFF, JPG, JPEG, GIF, PNG, BMP, PCX, TGA, JP2 (JPEG2000), PNM, etc. It also allows you to convert web pages to PDF, PS (postscript), WMF, EMF vector formats.HTML Converter command line application can be called from within ASP, VB, VC, Delphi, BCB, Java, .NET and COM+ etc. program languages. It uses advanced techniques to allow efficient asynchronous multithreaded operations. The download website of HTML Converter Command Line is http://www.verypdf.com/htmltools/htmltools.zip. 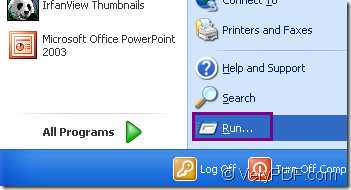 Just unzip the software into a suitable location in your computer for using. The next part will be the steps to rotate the page when converting wmf to pnm. 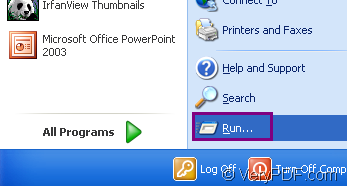 You can click “start”—“run” like Figure1 and input “cmd” in “open” edit box of the popup dialog box,then click “OK” button like Figure2. 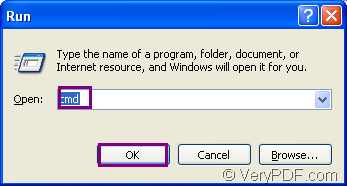 In the popup cmd.exe dialog box,you should input the command line to convert wmf to pnm.The command line contains called program,parameter,source file and target file.The called program is htmltools.exe which locates in the installation folder of HTML Converter Command Line.The parameter is the setting about page rotation angle.The source file in the wmf format file which needs to be converted in your computer while the target file is the pnm format file which should be defined by yourself.The following template is the one you should refer to when you write your command line. Please see Figure3 in which there is the example command line of the conversion of wmf to pnm. "C:\Documents and Settings\admin\Local Settings\Temp\htmltools\htmltools.exe" stands for the path of called program. -rotate 90 stands for the setting to the page rotation angle of source file. "C:\Documents and Settings\admin\Desktop\wmf\AN00932_.WMF" stands for the path of source file. NOTE:If you don’t want to input the long paths of called program and source file,you can drag the file from its folder into cmd.exe dialog box. test.pnm is the name of target file which includes the file name and extension name.You should not forget the extension name. The target file will be saved in current directory,please see Figure4. How to convert wmf to pnm? How to convert HTML files to PDF files and combine several PDF files into one PDF file? This entry was posted in HTML Converter (htmltools) and tagged wmf to pnm. Bookmark the permalink.